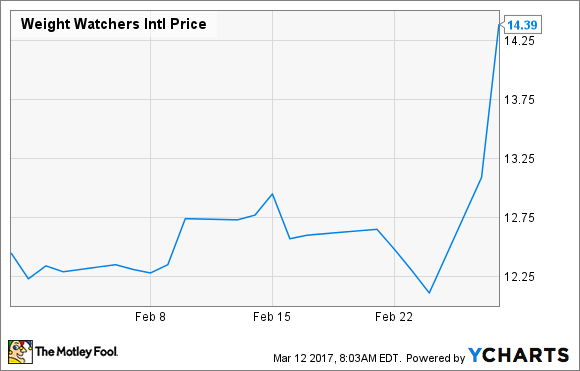 Why Did Weight Watchers Stock Gain 15% in February? The company has done a good job of adding members and slowly growing its business. Weight Watchers (NASDAQ:WTW) has turned its business around. That took more than Oprah Winfrey buying a 10% stake in the company and joining its board, but the media mogul and former talk show host deserves much of the credit. Winfrey was not the instant fix many people expected her to be, but her presence has helped over time. Recently, the weigh- loss company has received a lot of positive publicity from commercials starring the onetime talk show host. That has helped Weight Watchers deliver solid gains in membership, which sent its stock price soaring after it reported fourth-quarter results. The company finished Q4 up around 10% in both subscribers and paid weeks compared to the same quarter in the previous year. .It also reported that revenues had risen 5% during the fourth quarter versus the same period in 2016. That was enough to send its stock, which closed January at $12.45 to a February close of $14.39, a 15% increase, according to data provided by S&P Global Market Intelligence. Weight Watchers helps members lose weight. Image source: Pixabay. The company's stock spiked on the earnings release because the numbers verified that the publicity generated by Winfrey's commercials and media interviews had worked. Weight Watchers uses a subscription model, and the Q4 and full-year results showed that the extra attention driven by its celebrity board member has added subscribers. "We delivered positive member recruitment growth in every quarter of 2016, ending the year with 10% more subscribers than the prior year," said CFO Nick Hotchkin. "So far in 2017 our global marketing campaigns are driving strong member recruitment and interest in our Beyond the Scale program. With the year off to a good start, we are confident we will deliver revenue growth and higher profitability throughout the year." Going forward, Weight Watchers has to show that it can hold onto the members Winfrey brings. Those trends looked good in 2016, and they should continue into 2017, but retention will be as big a factor as adding new members going forward. Clearly, the company believes that will happen as it's predicting earnings per share will rise from $1.03 in 2016 to between $1.30 and $1.40 in 2017. Weight Watchers has shown that it can right its ship and return to growth and that it has a viable business model for the future. In 2017, shares should continue to rise if it can continue to deliver its message of sensible weight loss while leveraging Winfrey's fame and personal stories.